This is believed to be a specific Marriage Vashikaran Yantra to enhance the chances of getting married to the dream girl of your choice. The Tantra is very easy and simple for anyone to practice, but a word of caution before attempting this Vivah Hetu Yantra Prayoga, you must be sure that you truly love the girl you are proposing to; otherwise, you might get into trouble. 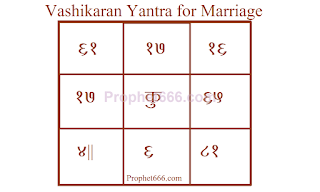 Before going to meet the girl you love and want to get married, draw this Yantra, which. I have shown in this image on your right palm with Saffron Paste, using any pointed stick and let it dry. Then, make the marriage proposal to the girl you love and wish to marry most politely and with folded hands [Namaskar Mudra]. There is no Puja or any other form of Tantra applicable to the Yantra. The only thing is to be certain that you are truly in love with her and are not smitten or infatuated. The Vashikaran Mantra is only for a a girl hoping to get married. For boys there are many other Mantras and Experiments given on this site. Can you please share same type of prayog for girls to do for their boyfriends as it is easiest. Hello Neelji, The mantra you gave last time for the winning the court case actually has started working.however I need some mantra to convince his parents and family and even mine as well so that everything works out smooth. Can you please help? Look around the site, there are many mantras and remedies for you problem published on this site, which are effective.